I journeyed today to New York City via The New York Times of February 21, 1918. I found a small but significant report “New Notre Dame Coach”. 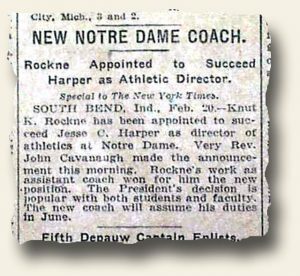 “Knut [sic] K. Rockne has been appointed to succeed Jesse C. Harper as director of athletics at Notre Dame… Rockne’s work as assistant coach won for him the new position… The new coach will assume his duties in June”. Knute is regarded as one of the greatest coaches in college football history. His career was cut short when he died in a plane crash on March 31, 1931 at the age of 43.